talking about how unfair Jessie is being sleeping in the same bed by herself for the past three weeks. Gina says its a 3 person bed that Jessie’s been sleeping on. Aaryn mention how it’s not fair that Elissa and the havenots don’t get to share beds with the other people. Aaryn: “There are glimpses of KAitlin being cool..” They both agree Kaitlin is getting much too cocky in the house. Gina and Aaryn agree that Kaitlin is mean to Jeremy. Aaryn saying she’s not liking Amanda’s attitude in the house that she’s coming across as fake. Amanda says that Nick is going around saying he’s going to put up Howard and Candace but Amanda doesn’t think he’s that dumb. She thinks Nick planned something with Howard and went around saying Howard is his target so people are suspicious. Amanda says that Jeremy is doing all the wheeling and dealing. She adds that everyone knows Aaryn would have put up whoever Jeremy says. Aaryn says Jeremy wanted Candace and Elissa up. Amanda wonders where Candace’s head is at. Amanda says she needs to hang out with her and McCrea. Amanda says that everyone is targeting Jeremy. Aaryn is worried that people will target her because they want to weaken Jeremy so they will take out the people closest to him like her and Kaitlin. Aaryn wonders why Jeremy is making deals with everyone in the house because everyone knows he has these deals now. McCRae and Gina join them. Aaryn thinks Helen will win MVP. Jessie is saying she been on board with the whole Elissa thing since day one. Nick explains that when Elissa started going around saying that he hadn’t even spoken to her at that point. Andy says he needs to talk to McCrea and Amanda next. Aaryn suggests he uses the HOH. Nick asks her what’s up. Amanda: “the third one would be hard.. I won’t get MVP so it doesn’t matter .. I would do the same thing McCrae did, Candace and Jessie”. Amanda: “i don’t have a third.. I have a very strong gut feeling you are getting MVP” . Amanda: “I have no allegiance to her”. Amanda asks him why he says he’s targeting Howard..
Amanda says that JEremy at one point thought Howard was a threat but now he doesn’t think that.. she’s confused. Amanda says that Spencer and Howard human behavior has changed a lot lately. says Spencer and Andy use to be b*tt buddies and now they never talk. Nick says he has three targets Helen, Howard and Candace and he swears if he wins MVP everyone on his side will know about it. Amanda says that her and McCrae are voting to keep him. 5:17pm Nick asks her if she was in his position what would she do? She isn’t sure she would do anything because Nick is safe right now. He asks her who she would talk to. She doesn’t know because the people she trusts is different than the people he trusts. McCrea isn’t worried about the vote but says Andy and Judd and flipping a lot. Nick says his relationship with Judd is improving.. McCrea adds that Judd and Andy are very paranoid. Amanda comes back and starts joking that they should vote out Helen. So sick of these girls. Someone should remind them that they are on Big Brother and NOT The Bachelor. Because all of these pathetic girls are just looking for showmances they are getting played. Once again, stupid women are playing personal and not strategically. Over and over again past players say – break up showmances and eliminate threats to your gameplay. Exactly how in hell is Elissa a threat to anyone at this point? What a bunch of friggin losers. It’s highly likely that Elissa would win many MVP’s, so getting her out is the way for Aaryn’s side of the house to have the opportunity to win MVP and HOH, thus giving them complete control in a given week. Though I agree, the girls are usually cast as eye candy and don’t care about gameplay nearly enough. Arynn, GM, and Kaitlin are being played and they are to blind to see it. Jesse just wants to fit in. They all annoy me but part of me is glad they aren’t with Helen and crew because those girls do not deserve to win. They have no game. I can only hope a non MC houseguest wins HOH and gets at least one of the mean girls out preferably Kaitlin seeing how Jeremy got with the MC…… they didn’t seem to happy when he was demanding they keep her. Maybe Kaitlin on the block can finally drive a wedge between the MC and make thins even more interesting. The only chance that there would ever be an all girl alliance, if if every HGs are females…. Otherwise get that BS out your heads, it will NEVER happen. Watching CBS…Simon, you don’t do Elissa justice. She’s so much worse as a player than even you describe…. She rarely on the feeds and when she is it’s pretty basic stuff. If these people vote Elissa out, I am scared to see the rest of the season. It will be BB12 all over again where the big but boring alliance takes over the house, kicking everyone out one by one. Rachel went after the girls because the girls were not as innocent as you remember. It was the girls who were the hardest on Rachel. Especially Brittany, she never passed up a moment to place Rachel in a negative light. The problem was Brittany would start the mess but couldn’t finish it. When Rachel responded to Brittany she ran to the Brigade and told them how mean Rachel was towards her. She never told them what precipitated the argument. Brittany who has never won anything in BB relies on her social game. Just because Britt never won HOH, doesn’t mean she wouldn’t have put up Rachel. She just was not in the position of power to do it directly, Britt tried to influence others to put up Rachel. Rachel who was a great competitor wins HOHs and POVs. She realizes Brit and the other girls were a threat. So to say Rachel didn’t play strategic I don’t agree with. Obviously you didn’t watch the whole season then, because actually Britney did win some things, she won an hoh and 3 pov’s. That was more than Rachel did that season. I do not completely agree. I agree Nick is a threat , but with the multiple fake deals happening, people will be exposed. That should provide some entertainment no matter who goes home. How do you figure that Elissa is a savior? She’s a horrible player and nobody except Helen can even tolerate her, except for Candace…but Candace lives in the clouds. It is getting hard to watch this show because of the low quality of people in it. If the people in the house would wise up and get rid of Jeremy, Kaitlin and Aryan, the show may be salvagable, but these people are really pathetic and I pray they are not just a sample of what America has turned into. What amazes me is that people were actually paid by CBS to select these losers. Personally, if Elissa get’s voted out I, wouldn’t really miss her. In my honest opinion, Nick’s chill vibe and stuff is a ton more entertaining than having the entire house making too many huge moves in only the third week. Sure, she may be rachel’s sister, but Rachel played the game a whole lot better. It is just going to be a short time until Aaryn gets voted out then the season would be more watchable, but having someone who will always win MVP just for being Rachel’s sister kind of ruins the fun of it. Did like Elissa but don’t lie liars and she lied to Nick. She is just like all of these over liars in the house. She needs to go! Umm….you don’t like liars?? Then why on earth are you watching Big Brother? It’s all about lying, scheming, backstabbing and trying to do whatever it takes to get to the money. They won’t come to their senses, because although they claim they are being bullied by certain 3, no one has the balls to actually get one of them out. so elisa is basically gone with Jessie going towards nick. Im OK with this if the rest of them come to their senses. it could be AWESOME if the 5 boy alliance is revealed, and Amanda and co go bat bleep crazy. I really want Judd to win HoH, whose with me?!?!?!?!??!??!? Also, are Jess and Judd a thing? Nick talks so sure of himself , that he will do this and do that , I had to check the chart on this website to make sure I didn’t miss anything. And he is still on the block. What an idiot. What ever happened to the cast being full of decent likable people with only like one or two villains? LOL It is the complete opposite this time. I’m shocked at how many people think Nick is getting evicted. Seriously, he has the MC plus GinaMarie and Kaitlin behind him. That’s 6 solid votes. The MC won’t turn on him because he can expose them to the rest of the house if they do that. And GinaMarie and Kaitlin despise Elissa and will do whatever Nick and Jeremy want. Elissa is getting evicted. Good riddance. Maybe now the MVP will go to someone who actually deserves it. I wonder if people realize that production prompts each HG in the DR to bluster, boast, and preen for the cameras. The DR’s are valuable in the sense that HG’s will reveal their unfiltered thoughts…but the second any of them start talking about how good they are or how their going to do this or do that, that’s production getting soundbites to splice in to edits and lets them cast heroes and villains and tell the story. It’s good someone is on to the all-boys alliance. Let it be a lesson to any future BB players, there’s always an all boy alliance. some succeed like Chilltown, Brigade, others fizzle and are destroyed, like Jase’s alliance in his original season. I guess it’s the dynamic of Big Brother, because in Survivor there has been all girl alliances that were successful. 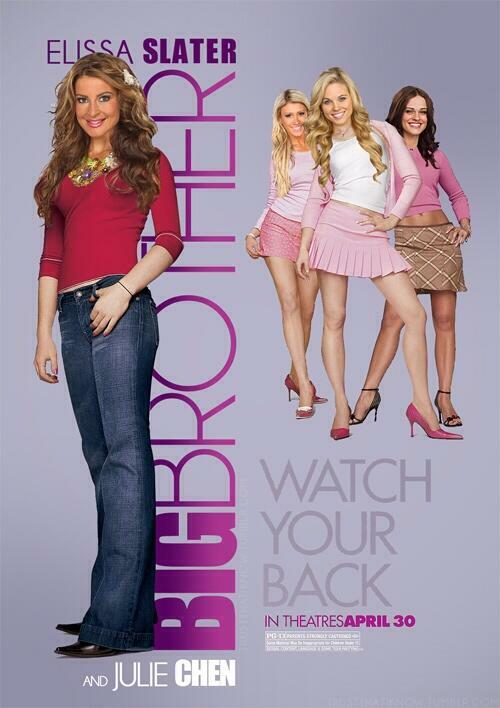 There’s something about Big Brother because it is very possible for an all girl alliance, maybe just not Big Brother. The Nerd Herd says “Wassup”…. I think that thing on Aaryns head is trying to hook up with that thing on GMs head…jessie will be sooo jealous! The coolest part of Aaryn toss away reveal that Jeremy, Spencer, and Howard are together is that 1) Amanda will assume she’s just trying to throw her off of Jeremy and Nick together and 2) Amanda has talked so much, even if she tells the rest of the house, it doesn’t matter because she’s already claimed this and everything else under the sun, and it won’t change that MC + mean girls = 6 votes. If Amanda keeps up the line that Jeremy, Spencer, and Howard are together then this next HOH/POV is must win for either her or McCrae and will be her only chance to stay. So has Amanda ran & told anyone what Aaryn told her yet about the alliance? I think Nick should out Elisa as a liar. The rest of the house could see she is not trustworthy. She is a terrible player. Big Brother needs to tweak the MVP vote. Maybe, make it like HOH, where you can not have it in consecutive weeks. Or let the house guests vote and weight the votes with the at home audience (like Dancing with the Stars) add the votes to determine the MVP. Home voter are just voting for favorites not good game play. Elisa is a bad player. The house guests get to vote who goes home and HoH chooses who goes on the block .America is voting their favorite for MVP but that’s something just the viewers can participate in. House guest vote and chose everything else. Comparing Big Brother with ” Dancing with the Stars ” . Hahahhahahahaha. Some people just have nothing else to do with their time. These girls are so pathetic. Latching onto these men they’ve known for 2 weeks as if they are soul mates. I wouldn’t even be upset if they were using their brains but they simply are not. Use the men like they are using you, but nope. Feelings have to become involved. Messing up your game to get vengeance for a person you’ve known for a week. Seriously? When will they wake up and realize that they are being used? I’m shocked that with all of the obvious muscle in the house, Jeremy and Howard, physical, Nick, mental, and Spencer, social, that these people can’t seem to even think for a second that there’s an all male alliance. Candice and Helen figured it out, yes. But it seems as though no one else can fully put it together, which is pathetic seeing as though these are the same people they are latching onto all day everyday (Aaryn/Kaitlyn with Jeremy; GM with Nick; Candice with Howard; Amanda with McCrae). Also, as much as I can’t stand Jeremy or Kaitlyn for that matter, Aaryn’s hate for Kaitlyn is transparent. Would she be talking so ill of them if David was still in the house? Absolutely not. They’d be having orgies in the HOH room right now. She doesn’t like the fact that they still have their “showmance” and she doesn’t. Not that she isn’t right in regards to how they are acting, only that she definitely wouldn’t be so “annoyed” about it if she had her boy toy in there with her. Jealous a tad? I think so. Dear Aaryn. Why are you so hatred to every single ethnic group? You been dislike Asian, blacks & even gays. No one is give a damn about you, your trash and go back the way you are. Do yourself a favorite and get evicted next week. You crazy like a little b$tch. Period! Sincerely, whole entire big brother fans. Maybe you need to focus more on your use of the English language before posting on social sites. Marie, I speak English and I have a disability called autism. Aaryn and Jeremy know none of them will win MVP right? Judd says he can’t wait to move into the HOH room tomorrow. I am Big Brother Royalty!